Working better than at home or the office in our coworking space in Gracia, Barcelona. 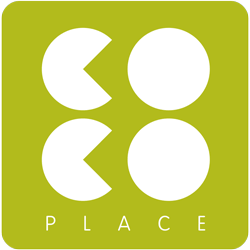 CoCo Place is a collaborative work space where you will be able to perform at your best in an optimal environment. 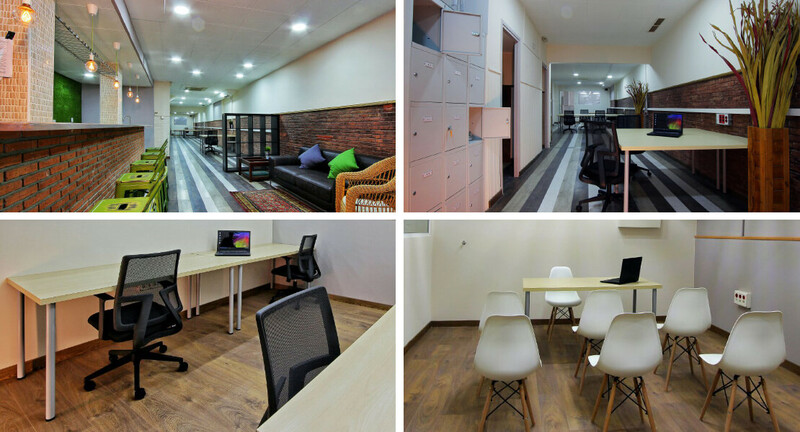 With the freedom to work like at home, but with all the services you need in a professional office, and where you can also enjoy moments of rest and recreation. We are building a new community of entrepreneurs and startups in the neighbourhood of Gràcia in Barcelona for people wanting to collaborate with new colleagues, using ‘el coco’ (read head there) in a reasonable size space designed to concentrate and communicate. Come on in! The Coco Place is located in Gràcia, a district of Barcelona where the city is still very human, always dynamic, with permanent social and cultural concerns and that has become the epicenter of collaborative work in Barcelona. 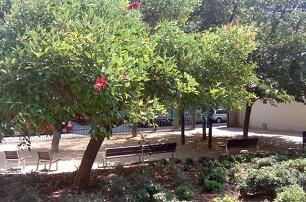 Inside the neighborhood we are next to a large open space, the gardens of Mestre Balcells. A short distance from the heart of the old village and yet far enough to enjoy a quieter work environment. This area has a capacity for 15 desks size 150x75cm. 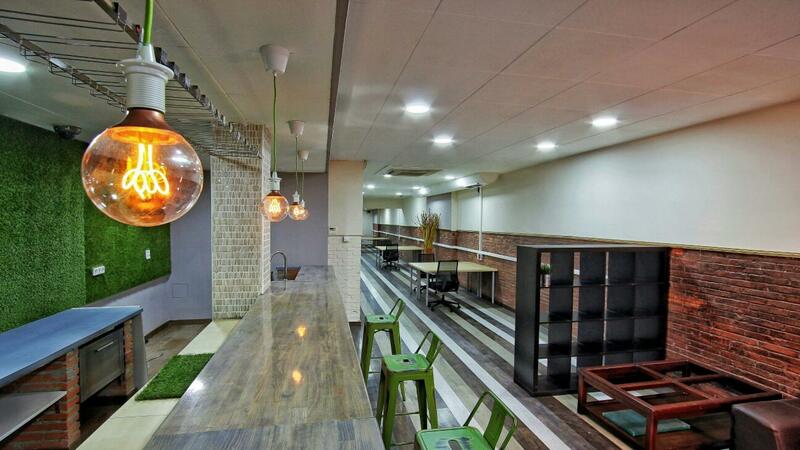 It is the closest to the common areas and it has more natural light. 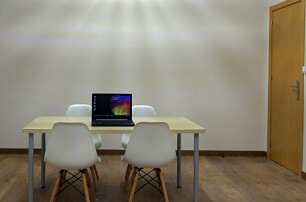 Work groups of 2, 3 or 4 desks. Up to 8 desks size 150x75cm. Work groups of 4 desks. Ideal for a big team or coworkers who wish for a place with more privacy. 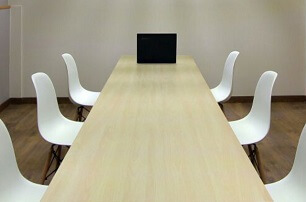 We have two meeting rooms A and B. A+B together become room C with twice the capacity by opening the movable partition. The configuration of the rooms is very flexible, adaptable to different needs and situations. Equipped with smart TV and whiteboards. Reading the newspaper, having a coffee, exchanging views with a colleague … instructions are not necessary to enjoy it. 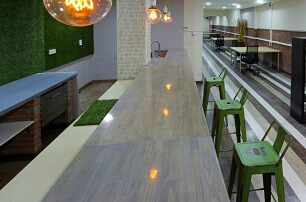 A great place to eat, relax, have informal meetings or to simply expect inspiration. We are very proud of our bar. How many great ideas took shape having a coffee in a bar? Surely many, as inspiration often walks through these scenarios. They say that Messi’s contract was signed on a napkin and it’s true… Sometimes the best deals are made sitting on a bar stool. Equipped with microwave, fridge, Nespresso and kettle. Next to the Coco Place we have a large open space: Air, trees, grass … It’s great to have it that close! 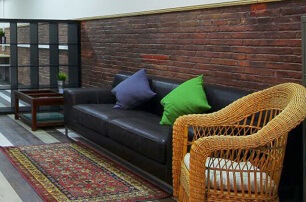 The offices can accommodate up to four people. They can be configured according to the needs of the team. Individual heating / air conditioning. It is your space if you appreciate total privacy. If you are two people.